Of all the thousands of techniques and principles of self-defense, nothing could be more basic, more fundamental, more… PRIMAL… Thank throwing your fists. The “punch” is the first thing a person learns (maybe second after the “slap”) and is hard-wired into us from millions of years of programming. 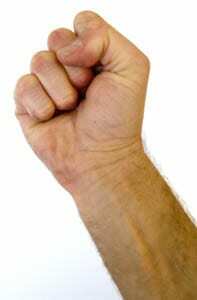 Considering how innate it is, and how often it’s used in self defense, it always blows me away how few people know how to properly make a punching fist that will both deliver serious power, and not get them INJURED. This largely stems from the fact that many martial arts don’t make a lot of contact… so people punching the air, or tippity-tapping each other won’t realize that they are practicing something potentially damaging to themselves… until it’s too late. There are martial arts and sports (like boxing) where they DO make very hard contact over and over… But even boxers can have poor form as a result of the ‘crutch’ of having their hands wrapped up like rocks when they train. I have a friend who is a boxer who recently fractured his wrist in a street-fight for this exact reason. You wouldn’t believe the number of people who break their wrists or fingers because they threw a GREAT punch that ended up damaging their hands more than the opponent that they punched. Third, and most often overlooked even by ‘skilled’ fighters, DO NOT BEND YOUR WRIST. There is an old saying “there is no wrist in boxing”. This is true in all martial arts. If you bend your wrist and make hard impact, you will fracture your wrist. Period. You wouldn’t do push-ups with bent wrists… Don’t punch with bent wrists. 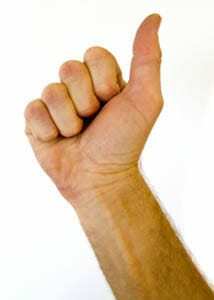 Doing pushups on your knuckles is, however, a great way to find this proper wrist position. you can also just make a fist and lean heavily into a wall with your fist to find this same wrist articulation. Two years ago I punched someone in the face(don’t know exactly where) but my bone in my hand is curved since then. It is the bone that leads to my pinky. Can you explain what happened and how to avoid this/will I damage my hand if I throw a punch like that or at all? Another thing to keep in mind (and this is particularly important to remember in street fights where you don’t wear gloves) is don’t curl your fingers under. By leaving them straight they don’t roll up under the pressure of a punch and cause injury to your finger joints or fingers themselves which often happens. Right on… This makes perfect sense! 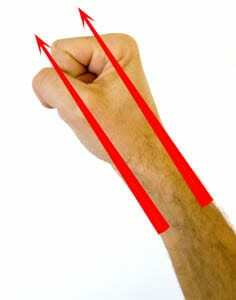 Thanks for the post… I was punching all wrong, and actually did hurt my wrist in the past (why I searched for this). Thanks again!